Hello and welcome back to another week of randomness! We understand that the content has been a little Croydon-centric recently, but expect the range to expand soon! 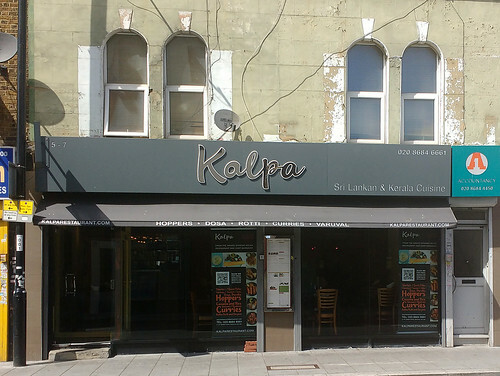 In the meantime, your featured article is Kalpa, CR0 2SB, a Sri Lankan and Keralan restaurant in... Croydon! Our write-up suggests the food is a bit hit and miss, but since all the recent recommendations mean you're surely likely to passing through Croydon, why not stop off? New articles move a bit further north, to Viet Hoa in Shoreditch: modern decor, and well spiced; and the Everyman King's Cross cinema. It's very posh and therefore both very comfortable and very expensive (like the rest of the chain). Updates have been made to The Duke's Head Hotel in Wallington, and The Royal Oak in Borough. Thankfully the pub remains excellent, the beer good and keenly-priced too. Finally, we must report the (thankfully temporary) closure of Mamuska! at Elephant & Castle, which is moving to another location nearby later this year. Polish dumpling fans can breathe easier. The food at Kalpa isn’t really all that hit and miss! I’m just quite fussy about things being too sweet. I definitely want to try more of the menu.